Mild cheese seasoned with pepper. Milled black pepper is the feature of this delicious, pungent Dutch cheese. 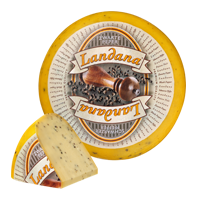 Landana BLACK PEPPER is very good on a cheeseboard.